SEOs and Webmasters will go to great lengths to try to get more traffic out of Google. One way to do that without increasing your search rankings is to make your existing listing in Google stand out. Uwe Tippmann from ABAKUS noticed that you can add emoji characters to your title tag and because the iPhone supports it, Google will currently show the special icons in your titles. 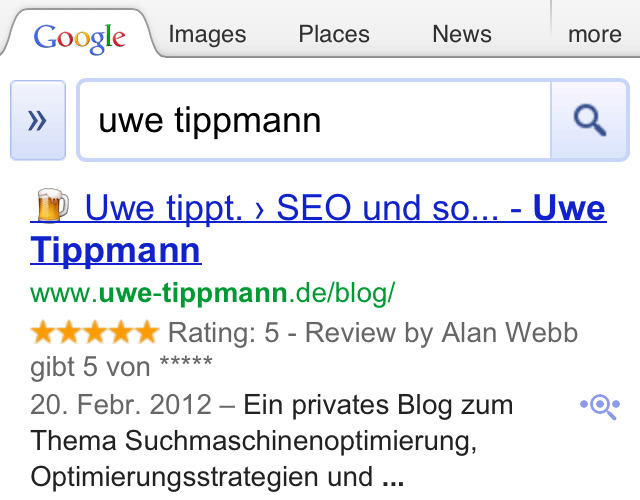 Here is a picture of it in action for a search on my iPhone on Google for [uwe tippmann]. I am sure Google will drop this from being supported as soon as they see this. People have done this before early on with unicode in the title tags, but Google no longer allows that, in fact that was almost a decade ago. Again, this only works on iOS devices such as iPhone, iPod Touch and iPad, while searching Google.